Another day, and another day trip. Today we're once again using the local bus service which will take us to Pollença town which is a short journey of 4 miles inland. PP and Alcudia share the similarity of being coastal resorts with lovely inland old towns. 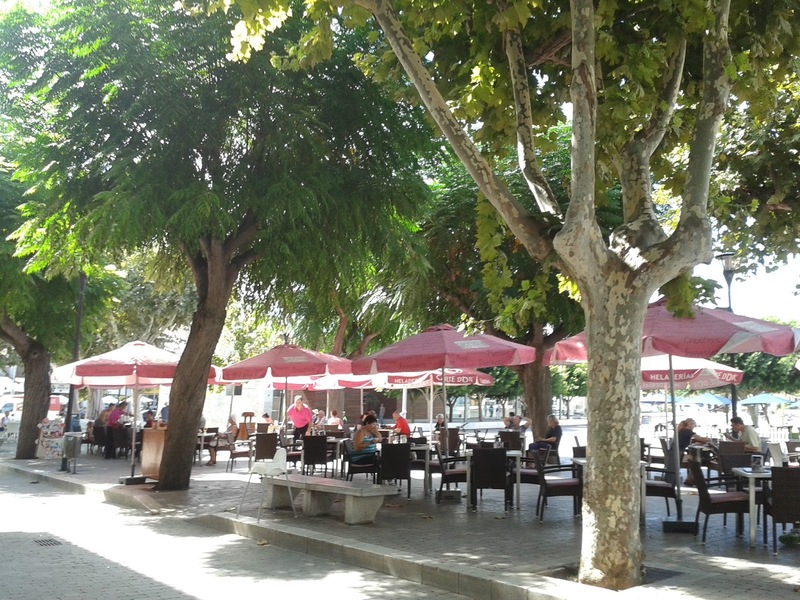 The weather is again a bit hotter today and I'm struggling with the heat after arriving in Pollença so it's not too long till we thankfully have a lunch stop on the main square which is anything but quiet today. 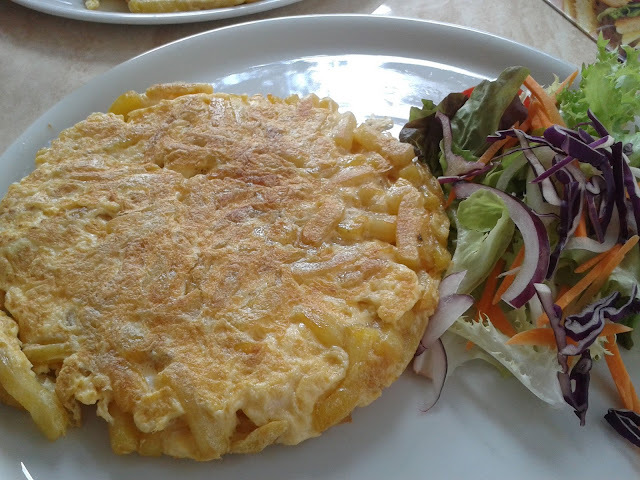 There's some kind of cycling event with a number of information stalls and there's also a BMX-style stunt display accompanying our lunch, which is a good old Spanish omelette! After lunch we take a stroll around the old town. I'm particularly taken with this old town street view. Here is a plaque which I discovered on our travels which was dedicated to those who fought for democracy in the 1936 Spanish Civil War. One of Pollença town's main attractions is a stairway of no less than 365 steps up to a chapel at the top of the hill, known as Calvary. A few people were attempting this but we were not among them. I managed a bog-standard 50 steps and that was all I could manage, what with the dodgy knees and carrying all this extra weight, :( coupled with the baking heat, anyway it is quite a challenge for anyone who is fit enough to manage it so good luck to them! By the way, the shop on the left was a bag shop which caught my attention because the radio was playing "Regrets" by Mylene Farmer - a fantastic song which will always be very special to me. ...during our coffee stop I received a text from one of my lovely old friends, the "ladies who lunch", who was also on holiday in another part of Mallorca with her husband. But time was ticking away and it wouldn't be long before we were heading back on the bus to PP, back to the hotel to get ready for another warm and pleasant evening in the resort. 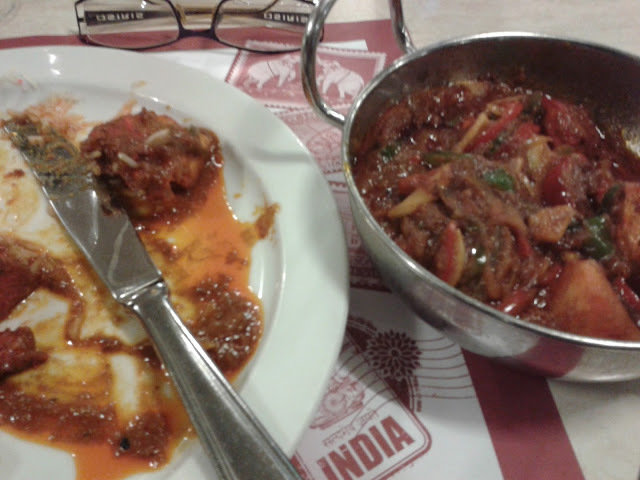 Tonight we had dinner at an Indian restaurant on the main square, and very tasty it was too! Of course there is a pattern developing here.... the restaurant was literally just a few yards away from the now-legendary Bony's. 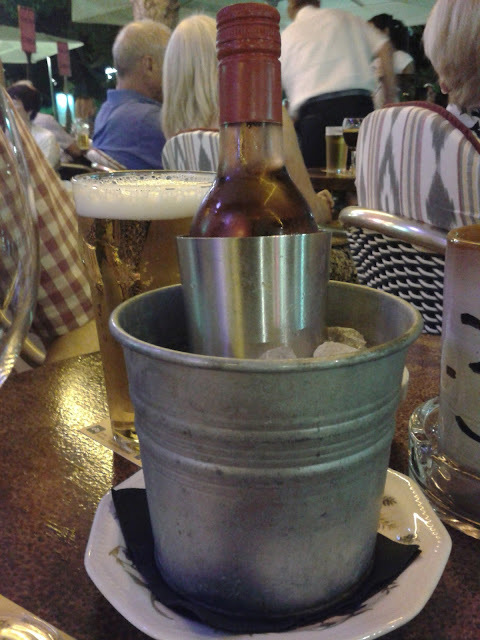 No cocktails for me tonight though; but I thought this mini-wine bucket was pretty fab and worth a photo opportunity! In the next instalment: a lazy Sunday in PP. Today brings the first of our 'day trips' although we're not heading too far out of PP as it's only a 15 minute bus journey to Alcudia town. The local buses are very frequent but also get very busy. Alcudia is a familiar name to many British holidaymakers but the main tourist area is actually Port d'Alcudia and Platja d'Alcudia, which are different from Alcudia town, which is inland, and where we are today. The first thing which greets you on arrival is the town's medieval wall, which we later walk a section of - I found it a bit scary though, and didn't last very long! 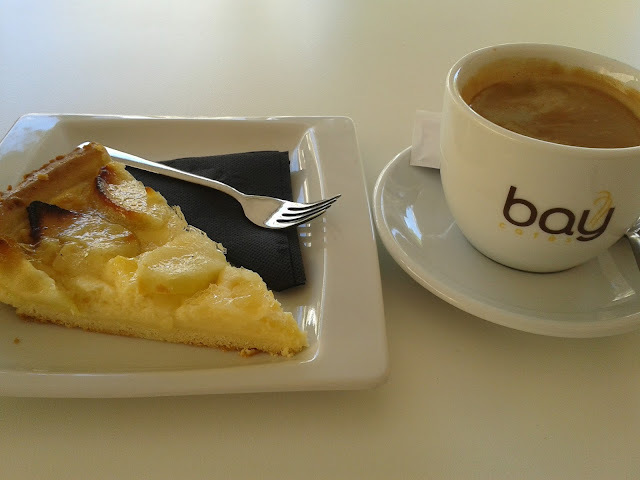 Time for a coffee stop at one of Alcudia's many outdoor cafes. The weather is a lot warmer today and I guess that the fact that we are inland means we're missing out on those sea breezes. Alcudia is a lovely old town with lots of little narrow winding streets. Within the centre of the town there are lots of little shops and a good selection of restaurants. 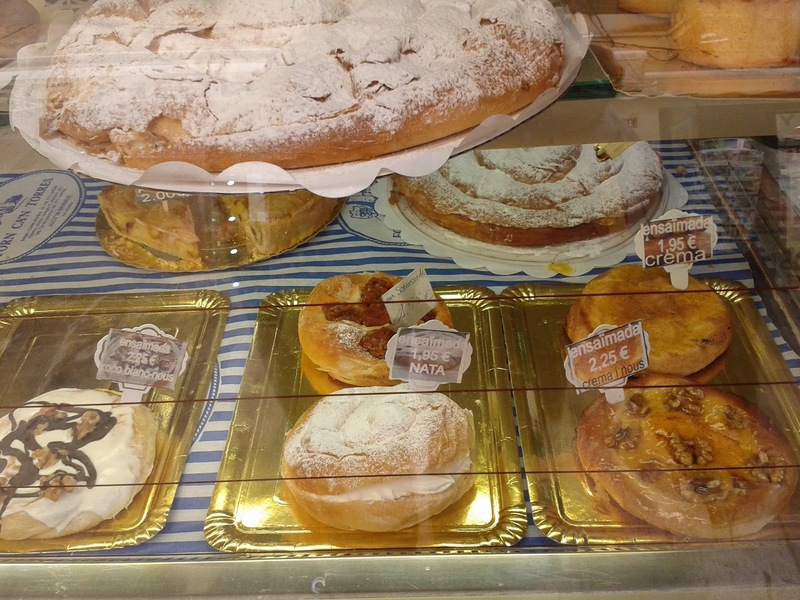 Some cake shops too: unfortunately to this day I still haven't tried the Mallorcan spiral speciality Ensaimada for one reason or another - so here's a picture of some instead, from a cake shop in Alcudia. One thing I must mention is that there has been a severe lack of Spanish hunks so far during this holiday. Most of the waiters in PP have been a bit too old :(((( Finally though there is some hope as one of the waiters in the restaurant where we're having lunch today catches my eye! 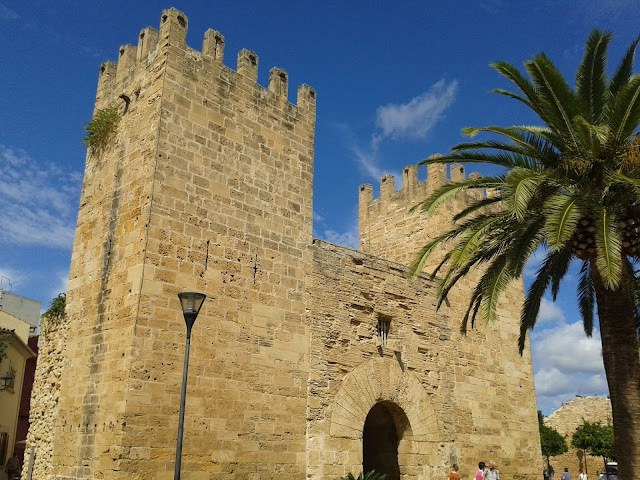 After lunch we explore Alcudia further, including that very short stint on the town's wall. We then walk around the perimeter of the wall around the town. By late afternoon we have a very welcome stop where I enjoy one of my traditional holiday faves - a fresh orange juice. A short journey back to PP on the bus and then it's back to the hotel to get ready for our Friday night out. Would PP be jumping tonight? Party central? Umm....no. But do you know what? That's fine by us. We are really enjoying this most laid-back of summer holidays. 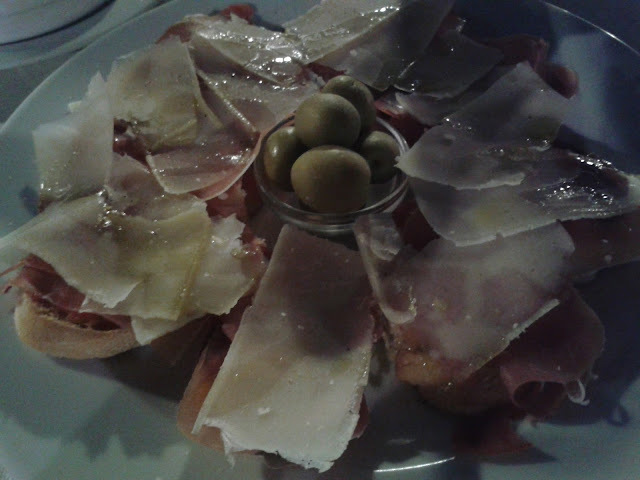 And tonight it's tapas time! After the past 2 nights trying and failing to get into this very small tapas restaurant on the seafront, it's third time lucky as we've pre-booked. We have a lovely meal - so far we've really had good luck with our meals in this resort. It's after midnight, but you'd never know it was Friday night as the journey back to our hotel is as quiet as ever! In the next instalment: we're off to Pollença town. 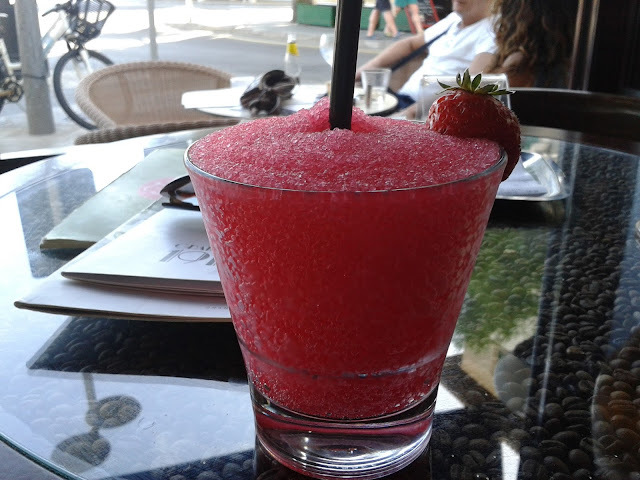 Here, at long last, are my posts about our summer holiday from two months ago. 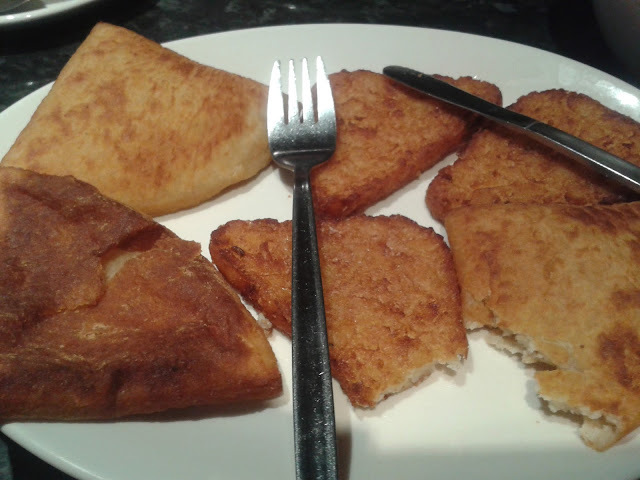 Sorry for the delay, the last two months have been very busy but also have been a personally difficult time; I didn't really feel like blogging or any other hobbies which I enjoy, but time is getting on so I thought I'd finally publish these posts. Our summer holiday destination this year was a place with an identity crisis. In the English language it's known as 'Puerto Pollensa' but once you arrive there it's known as Port de Pollença - however for the purposes of these blog posts I will refer to it as 'PP'. Whatever you want to call it, PP is a resort on the north side of the island of Mallorca. Two years ago we spent a very enjoyable week in Palma city (on the south of the island), so it would be interesting to compare and contrast the island's capital city with one of its quieter and classier resorts. For PP is certainly no Magaluf - it sells itself as a family-orientated resort with no 18-30 culture in sight. 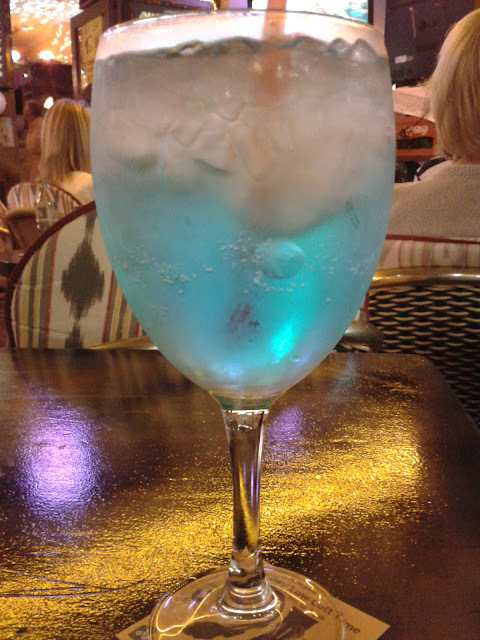 After the dark and turbulent past few months, it was time to try something new - yes you may not believe this, but in all my years of travelling, I've never visited a conventional Spanish holiday resort. In the planning stages - after Croatia and Portugal were ruled out due to financial and other considerations - PP ticked all the boxes. A small, fairly quiet, compact and walkable resort by the sea, with good connections to nearby towns and cities, seemed like the perfect place to hang out for a week and unwind. It's an early morning flight from Glasgow Airport to Palma. Of course being the big Frankie and Benny's fans which we are, we don't need an excuse to pay a visit - and there's something wicked about eating hash browns and potato scones (pictured above) for breakfast just after 4.00am! After a fairly quick flight, we arrive at Palma airport and passengers are then transferred to the appropriate coach for their particular resort. And it isn't long before we're enjoying the delights of the Mallorcan countryside, with its spectacular mountain backdrop. After what seems like an eternity of dropping passengers off at the numerous hotels and apartments, we eventually arrive at our hotel. The weather is bright and sunny, with a strong breeze - certainly very different from home where it's dull and typically becoming cool for this time of year. PP has a long promenade stretching from the 'Pine Walk' at one side to the end of the resort at the other, before heading into Alcudia town. 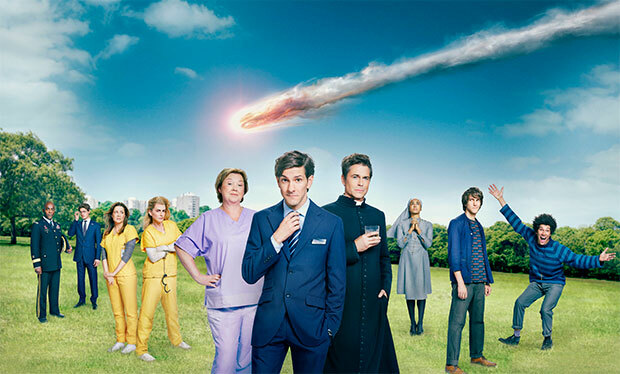 But more about that later in the week. It is wonderful to be here, and the healing qualities of a summer holiday quickly become apparent. I wasn't really sure what to expect, but I'm surprised at how quickly I begin to feel relaxed. The seafront is lovely, the beach is just minutes away and there are lots of little boats out at sea. The seafront is packed with restaurants and shops, small supermarkets, souvenirs and clothes shops as you would expect from a resort. My immediate impression of PP is that it is a very laid-back resort and the main categories of holidaymakers at this time of year would be either families with young children, young couples, middle-aged or older couples.....and there's one particular type of actvity which is very popular here. PP is cycling-daft, professional and amateur cyclists come here to train in the winter months, and over the week the 'peloton' of various different cycling groups dressed in all their proper cycling gear is a regular sight. 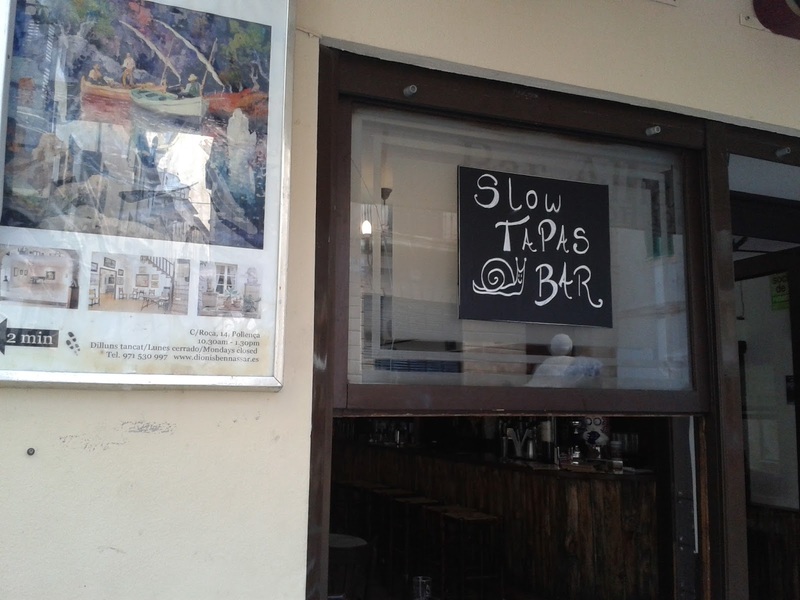 There is one particular cycling-themed bar/restaurant here - but more of that later in the week. After getting our bearings, and my 'expert' navigation getting us lost in the back streets, we eventually find our way back to the hotel to get ready for an evening out. 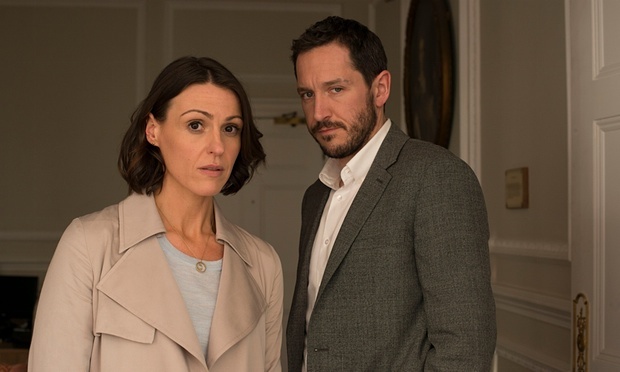 What we're not prepared for is the need to pre-book a table at many of the town's restaurants, particularly those in the top 30 on Trip Advisor (and I don't even mean the uber-posh ones). 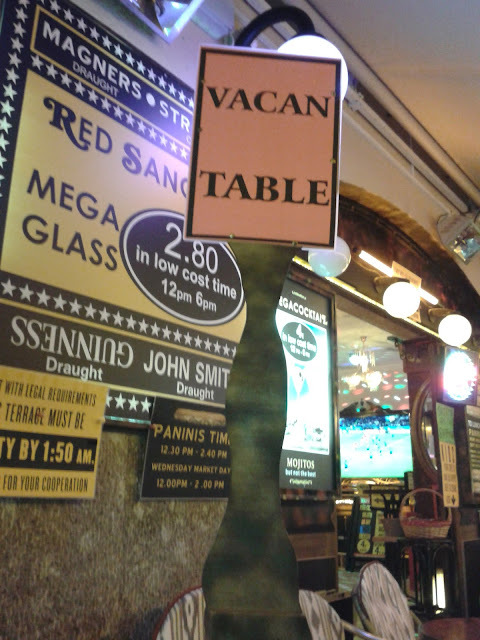 SO just when our evening was turning into 'no room at the inn' we eventually find somewhere to eat. It's Gazpacho time!! 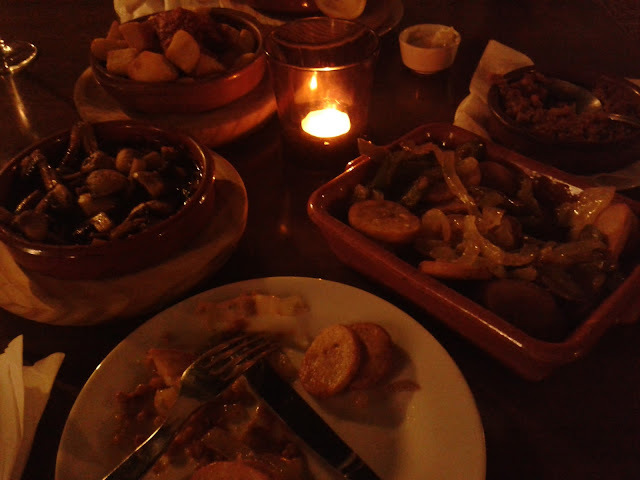 Yes we are doing some very cliched Spanish dining tonight - that's some of our vegetable paella pictured above. Having checked out a lot of restaurant menus there is a great choice, something for everyone, lots of vegetarian options and tapas are everywhere. We are going to love it here! After a late night drink at PP's most famous and wacky bar, we make our way back to the hotel via a very quiet seafront. We also quickly discover that although PP feels like a very safe resort, it's not always a very well-lit one, so the 'assistive light' on my phone comes in very handy to guide us home, once we leave the seafront! In the next instalment: exploring the resort. This year's NRJ Music Awards took place last night in its traditional home in the Palais des Festivals in Cannes. It was the 17th edition of the awards. Over recent years the NRJ Music Awards has attracted international media attention, although this is entirely related to the high number of international A-list artists who turn up on the red carpet, rather than a sudden interest in French music. But here on this blog I only care about the French music and couldn't care less about those overexposed artists whose songs turn up on NRJ and every radio station, everywhere in the world, every day of every year!! The thing you notice straight away in the French winners' list is the dominance and popularity of "The Voice". Unlike the UK version of the show which has failed to produce a commercially successful artist (apart from Becky Hill who has been the featured vocalist on a few dance hits), France's "The Voice, la plus belle voix" started off the career of 18 year old Louane Emera who then went on to appear in the hugely successful film "La Famille Bélier" which in turn kicked off a solo career which has made her one of the biggest selling artists of the past year in France with her debut album "Chambre 12". 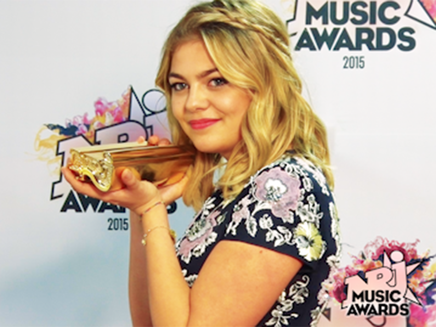 Above: Louane shows off her award. The next winners rose to fame on the 3rd series of The Voice which was won by a certain Kendji Girac. 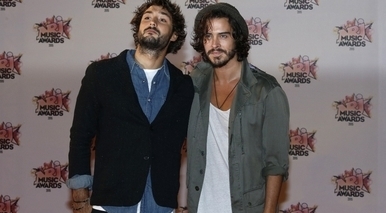 Acoustic duo Fréro Delavega went on to release a very successful debut album of bright and breezy tunes. Now as you know I've never really been a fan of the 'acoustic' style of music which has been popular over the last few years but I find Fréro Delavega very agreeable as they seem to follow a more upbeat musical style rather than the dreary acoustic ballads which have me reaching for the off switch. And even better, they do it in the French language! Just one thing though....you do not turn up to such a glamorous occasion dressed like that! Above: Fréro Delavega, who didn't get the 'dress smartly' memo. 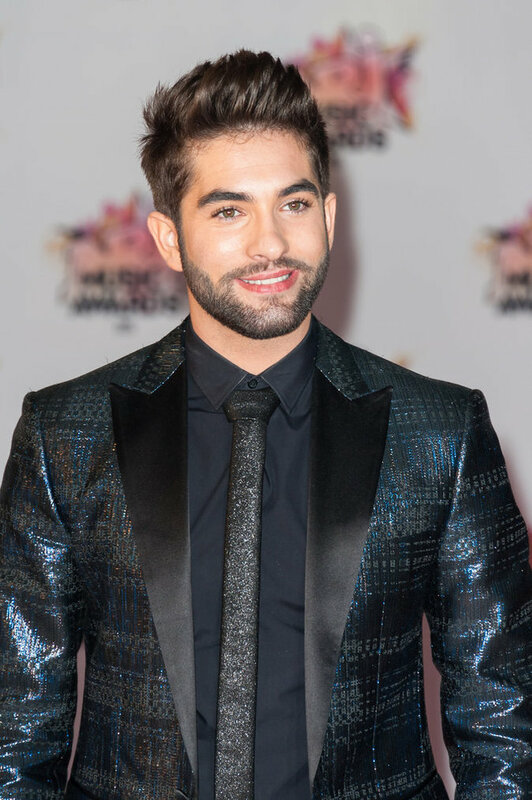 Finally, it was another successful night for Kendji Girac, the 19 year old who's taken French music by storm over the past couple of years with his flamenco-flavoured pop with a modern twist. 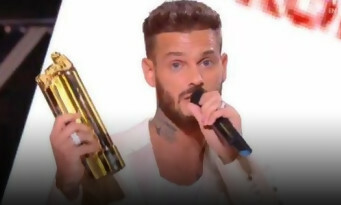 After winning best newcomer and song of the year awards at the 2014 NMAs, his song "Conmigo" was chosen in a public vote as French song of the year. I do love Kendji's music but "Conmigo" IMHO isn't really one of his best songs as it's more generic r'n'b than the flamenco style which I prefer. Nevertheless I predict a lot more success for him in years to come. Kendji has just released his second album "Ensemble" which is packed with more latin-flavoured pop bangers and will soon be making its way to my record collection. Above: Kendji on the red carpet. Who knows - he might even go on to be as successful as this year's top French male artist M Pokora, who's been winning NRJ music awards since 2006. Matt's another artist with a talent show connection; those of us with long memories (!) will remember him from the French version of Popstars The Rivals in 2003 as a member of Linkup. 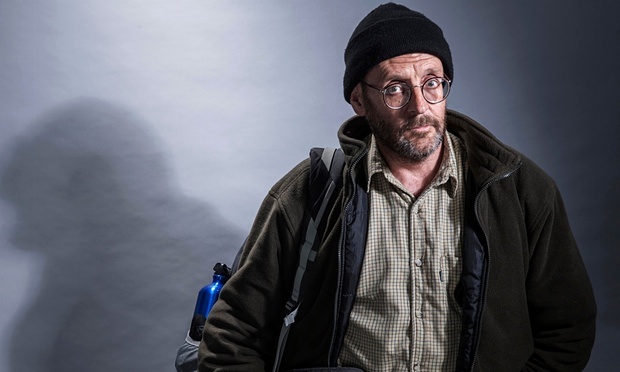 Above: Another in a long line of awards for Matt Pokora. There was some disappointment though for the fans eagerly awaiting Mylene's first live TV performance in a long time, as a) she and Sting pre-recorded their performance of "Stolen Car" and b) the vocals weren't live but were playback. Nevertheless though it is great to have her back. I haven't had a chance to listen to clips of the new album yet - I'll approach this one with some trepidation as the last couple of her albums haven't done anything for me and came nowhere near the greatness of her classic older material, from Cendres de Lune up to and including Innamoramento. Everything after that has been a disappointment for me, mainly because I have compared it to those older albums; but then again I guess that even a relatively disappointing Mylene release is still better than most of the overhyped junk passing for popular music these days.